Moussa Traore was born and raised in Mali, West Africa. 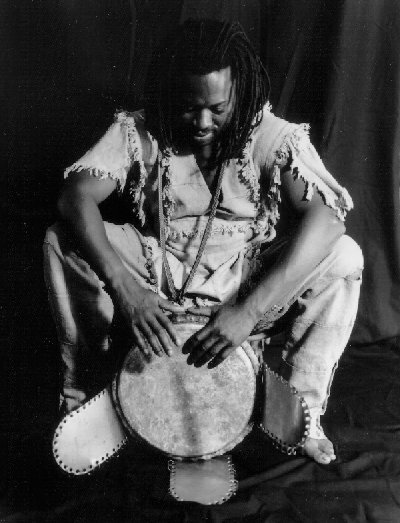 He has been playing the djembe for the past thirty years, and in 1984, after completing a twelve-year apprenticeship, he was deemed a "master" by his teacher, Sega Cisse. Moussa has achieved great recognition throughout Mali as an accomplished musician in the theater, in traditional ceremonies, as well as in the Malian pop scene. Among musicians in Bamako, Moussa is considered to be one of the top djembe playes in the country. Since moving to the U.S., Moussa has continued to distinguish himself as a highly respected teacher and performer. He has given drum workshops in cities throughout the U.S. Currently, he is teaching at schools, teaching weekly community classes, leading drum ensembles for West African dance classes and performing with his troupe Timinandi and other Malian artists.